Flying into La Paz gives a glimpse of the rugged terrain the city is built on. It reveals densely packed buildings clinging to vertical hillsides, seeming to flow down into the valley like a river of red roofs, all bordered by looming mountains. Thankfully, this spectacular birds-eye view isn’t reserved solely for airplane passengers or actual winged creatures. 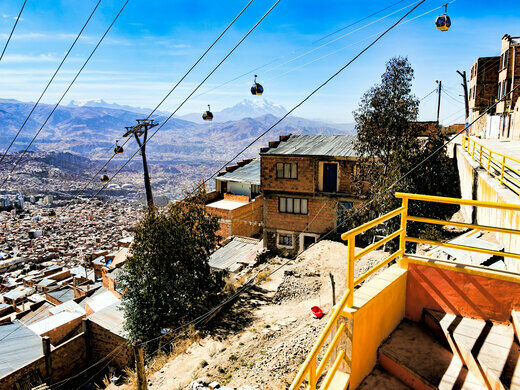 The La Paz–El Alto metropolitan area uses a sprawling cable car system as its main mode of transportation, making a trip between the cities of La Paz and El Alto seem more like a ride at a fair than a routine commute. 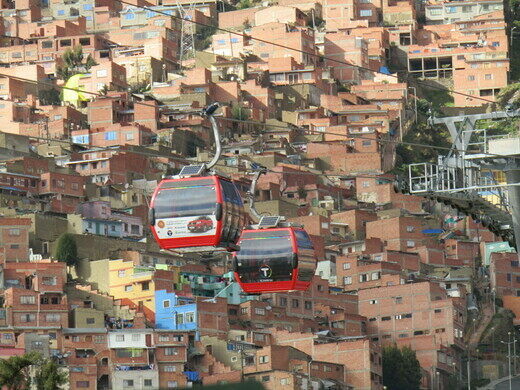 Colorful gondolas whizz above the cities and mountainsides, connected to a network of cables that stripe the sky. Mi Teleférico is the first urban system to use cable cars as its main method of transportation. When it was built, it was said to be the world’s longest aerial cable car system. Originally, the transit system had three lines: Red, Yellow, and Green, which symbolized the Bolivian flag. It expanded in 2017 to include two more lines, and future ones are also in the works. Each line has multiple stops. You can spend a day riding the cable car, taking in the sights while soaring through the air. You’ll discover quaint rooftop patios and other intriguing finds hidden among the brightly colored buildings. The address leads to the station for the Green Line in La Paz. A ticket costs 3 Bolivianos, but you will need one for each line. You can buy them all at once to avoid standing in lines. The red line stops at the Cemetery General and then goes up to El Alto. It’s a quick ride to El Alto on the cable car which would otherwise be a long bus ride.